String theory is a theory in fundamental physics. Certainly it is, mathematically, a structure that contains in various limits a plethora of quantum field theories. Its interest for experimental high energy physics lies in the hypothesis that it provides a theory of everything in the sense of fundamental physics, but the jury on that is still out. Below we indicate the basic idea and provide pointers to further details. See also the string theory FAQ. Perturbative string theory is something at least close to a categorification of the following description of perturbative quantum field theory in terms of sums over Feynman diagrams. Recall that in quantum field theory one approach to make sense of the path integral is the perturbation series expansion, which interprets the path integral for the scattering amplitudes (the S-matrix) as a certain sum over graphs of certain numbers assigned to each graph. The graphs are called Feynman diagrams, the numbers assigned to them are called (renormalized) scattering amplitudes and the sum over graphs of (renormalized) amplitudes is the perturbation series or S-matrix. The amplitude assigned to a single graph with nn external edges is interpreted as the amplitude for nn “quanta” or “particles” of the fields in question to interact in the way indicated by the graph. Crucial for the motivation of the idea of string theory is the observation that this (renormalized) amplitude assigned to a graph is itself the correlator of a 1-dimensional quantum field theory on that graph: the “worldline quantum field theory” describing the (relativistic) quantum mechanics of these particles. This is usually a sigma-model with parameter space the given graph and target space the spacetime on which the fields live for which the perturbation series computes the path integral. The premise of perturbative string theory is to replace the perturbation series over correlators of a 1-d QFT over graphs by a sum of correlators of a 2-dQFT over 2-dimensional surfaces – called worldsheets and hence produce an S-matrix this way. Again in simple cases this 2d QFT is a sigma-model whose target is the spacetime in which one computes interactions. In analogy to the previous case, one thinks of the amplitude assigned this way to a surface as the amplitude for the boundary arcs – the strings – to interact in the way given by the surface. while there are fewer choices to be made by hand, it turns out that the effective particle content that does arise automatically from this prescription happens to be structurally of the kind one would hope for: the massless effective particles described by the string perturbation series happen to be gauge bosons, fermions charged under them, and, notably, gravitons. This is structurally exactly the Yang-Mills theory input of the standard model of particle physics combined with perturbative quantum gravity that one would hope to see. while the worldsheet 2d QFT whose correlators are summed over surfaces are themselves much easier to handle than the full target space quantum physics they are used to encode, a fully complete and rigorous theory of 2d QFT is available only in simple special cases. In particular, even though there are fewer arbitrary choices involved in the string perturbation series as compared to the ordinary Feynman perturbation series, one crucial choice still present is that of this worldsheet 2d QFT. By the above, every choice of worldsheet QFT (called a choice of “vacuum”) corresponds to a choice of effective target space geometry (to be thought of as the one that the perturbation series computes the quantum perturbations about) and particle content (see 2-spectral triple for more on that). One would therefore like to understand the space of all worldsheet QFTs whose effective target space geometry and particle content is close to the one experimentally observed. After many years of rather naïve approaches to handle or not to handle this, it has more recently at least come to the general attention that there is something to be better understood here. More fundamentally, already the role of the original perturbation series in quantum field theory is actually not fully understood. Its main success is the observation that truncating or resumming the perturbation series in a more or less ad hoc way, it does yield values that very well describe a plethora of real world measurements. One imagines that there is a non-perturbative definition of quantum field theory such that in certain well-defined circumstances the perturbation series does yield an approximation to it and is a posteriori justified. If so, there should be an analogous nonperturbative definition of string theory. There is a large ratio of speculations as to what that might be over solid results about it. While therefore the premise of perturbative string theory is conceptually suggestive for various reasons, there is to date no connection to experimental phenomenology (apart from the fact that conceptual insights into string theory have helped analyze quantum field theoretic data, see at string theory results applied elsewhere). As a result much of the substantial outcome of string theory research is more in mathematical physics (if done well, at least), exploring the general theory space of quantum field theories and their UV-completions, than in realistic model building (though there is no lack of trying), where it remains very speculative. This has led to public or semi-public debates about the value of string theory for actual physics. See at criticism of string theory for pointers. For both the bosonic string and the superstring the corresponding Polyakov action has a gauge anomaly for the conformal symmetry, depending on the dimension dd of target space, and on the strength of the dilaton background field. For vanishing dilaton field this anomaly vanishes exactly for d=26d = 26 for the bosonic model, and in d=10d = 10 for the superstring. For target spaces of these dimensions one speaks of critical string theory. In as far as string theory is expected to have relevance for physics at all, it is usually expected to be in this critical dimension. But also noncritical string models can and have been considered. 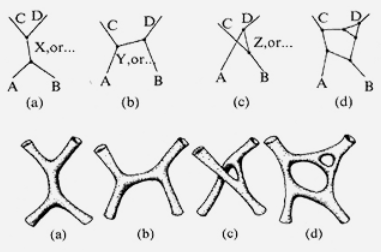 For the heterotic string (necessarily closed) the anomaly cancellation condition is known as the Green-Schwarz mechanism : it says that the background fields of gravity and B-field must organize to a twisted differential string structure whose twist is given by the background Yang-Mills field. The large volume limit of the partition function of the superstring on a given target spacetime is an elliptic genus of that manifold (Witten 87), the Witten genus (see there for more). Since the Witten genus in turn is the decategorification of the string orientation of tmf, this suggests that tmf-generalized (Eilenberg-Steenrod) cohomology classifies full string theories, in refinement of how the classification of D-brane charge (just the boundary conditions for open strings) is given by K-theory. A non-trivial conistency check of this idea is announced in (Nikolaus 14). Beyond the speculative hypothetized role of string theory as a theory behind observed particle physics, the theory has shed light on many aspects of quantum field theory, both on the conceptual structure of quantum field theory as such as well as on concrete theories and their concrete properties. Some of these string theory results enter crucially in computations that are used to interpret particle physics experiments such as the LHC. Pierre Deligne, Pavel Etingof, Dan Freed, L. Jeffrey, David Kazhdan, John Morgan, D.R. Morrison and Edward Witten, eds. based on the insights of Green-Schwarz anomaly cancellation. Pure mathematics work which is closely related string theory and was awarded with a Fields medal includes the following. formality theorem and formal deformation quantization via holography of Poisson sigma-model string. These tools [[ used in the proof ]] are all rather old, known for at least twenty years, and one may wonder why they have not before been put to use in connection with the Riemann moduli space. Maybe we lacked the inspiration that comes from the renewed interaction with physics, exemplified in conformal field theories. Last revised on April 4, 2019 at 03:39:11. See the history of this page for a list of all contributions to it.